THE ADAPTATION THAT NOBODY ASKED FOR!!! 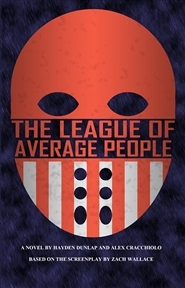 Introducing, for the first time, the League of Average People trilogy in the written word! Unless you count the script. Which we don’t. The League of Average People are everyone’s favorite losers! Join Crossbones, Sheriff, Dislexus, Mr. Nice Guy, Bow and Arrow Dude, and Ginga as they protect a town that never once asked for their help. When law-breakers are about, the League is there to help! Except when it’s raining. Or when there’s something good on TV. Or if they just don’t feel like it.